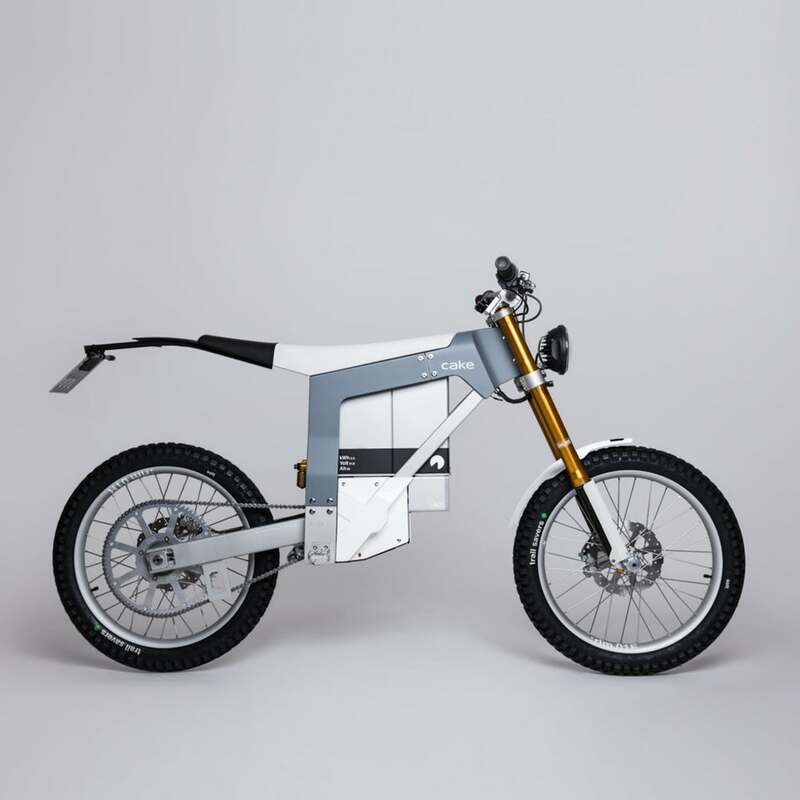 We told you about the CAKE Kalk some time ago, an innovative 150 pound electric dirt bike with 24″ wheels. 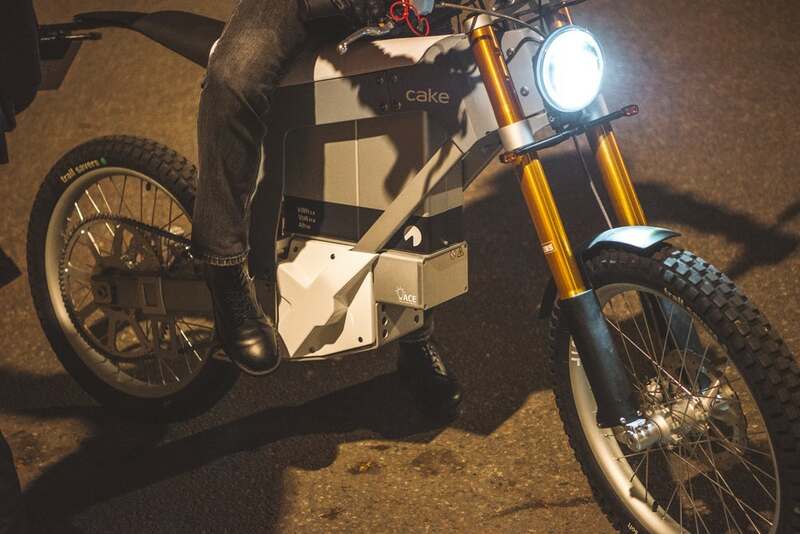 CAKE has now announced that it will be producing a street legal version called the Kalk&, which will be available in the U.S.
(Stockholm, Sweden – January 30, 2019) – CAKE, the Swedish manufacturer of lightweight electric off-road performance motorcycles, today unveils the Kalk& (and), the first street legal bike by CAKE. The Kalk platform expands with Kalk& (and), an all-electric street legal motorcycle, engineered for the outback & allowed for your daily commute. Today, the Kalk& (and) makes its debut at the Outdoor Retailer Show in Denver, Colorado. The bike will be street legal within the United States and EU. Spec, final price and availability will be revealed at the sales launch in late March 2019. The pre order will be 200 USD or EUR, the currency depending on the customer’s delivery address. The Kalk& (and), the street legal sibling of its off-road precursor, the Kalk OR, may look similar on the outside, but does have a few developments on the inside. Just like CAKE’s first bike, the Kalk& (and) is also strongly influenced by downhill and enduro mountain bikes, in both the feel and handling, and its design takes into account the two sports’ geometry, suspension and components. However, its gearing differs slightly and top speeds have been enhanced, beyond100kph, in accordance with highway pacing. Follow its debut in Denver, the Kalk& (and) will head to Munich, to be featured at ISPO in the beginning of February. This bike better be a lot more fun to ride than to look at. yikes. also “kalk”? not helping. Stupid name for sales in a western country……….maybe Juicy Couture or Northwest would sound better ! In this world where Pininfarina and others exist, this is a monstrosity to behold ! Can’t even score in a Transformer movie ! IKEA would not permit it in their showrooms. This looks like stiff horse crap. Only an exibitionist wohld be seen on this and the name kills this product. I am going to look at a ZERO sometime in the future, just wish Z had a two speed trans, to save the volts at hwy speed. It takes a certain amount of power to move a bike at any given speed. If you change the gearing to reduce voltage/rpm, you’ll need to increase the current to maintain the same power. This isn’t very efficient. Your two-speed trans may possiblyl sap more power than a single speed one and running speed controllers and motors at higher current means more energy lost through heat. You’ll likely lose range by reducing rpm! >just wish Z had a two speed trans, to save the volts at hwy speed. My understanding is that because an electric motor has a completely flat torque curve (up to a certain RPM) that different gearing won’t provide any savings in power consumption. i.e. highway speeds would require less RPM, but more torque to maitain the speed. The only benefit would be to gain acceleration by having lower gearing available. The power losses through having a gearbox then outweigh the practical advantages of not having one… But, I’ve been known to be wrong! OK. Just figuring like a piston skull. If the Tq output is the same for most of the rpm range, to increase the speed/rpm requires more I or E (P=IxE), so an increased load by taller gearing needs more I, however the rate of work being done (hp), is less for a given speed with taller gearing and the same Tq. Where has the juice gone ? Just getting used to electricity vs horses. Maybe the slope of Tq needed for a load change is different from an engine. Obviously electricity is a passing fad . It will never work . The only real constant for a brushless electric motor is the rpm they turn at a given voltage (called kV, i.e. a 3000kV motor will spin at 3000 rpm if connected to a 1 volt power source). Apply more drag to them and they’ll draw the current necessary to produce the power necessary to still spin at that rpm while moving the drag until they reach the limit of how much current their power source can supply at that voltage or until they overheat and ruin their magnets (or if poorly designed, melt their wiring). (remember, V=IR, so the more load they are under, the lower their electrical resistance is, which is how they draw more current when under load). This does mean that, unlike a gasoline engine, if you gear up an electric bike it will produce more power at full throttle (if the battery can supply it). Electric motor efficiency isn’t nearly as affected by RPM as internal combustion engine efficiency, so a multi speed gearbox wouldn’t do much for range, and they actually produce maximum torque at 0 rpm so a multi speed gearbox wouldn’t help acceleration (which is why Teslas accelerate so fast despite having single speed transmissions). Where a multi speed gearbox might really come in handy is keeping the motor cool at slow bike speeds under load by reducing the torque the motor needs to produce thus reducing the current it’s drawing. Surely that’s not true at all. A gear box is a series of torque multipliers. Of course a lower gear ratio would help acceleration, right? Thank you all. Splendid responses with sensible perspective. Now I gotta fit sit on one. Not really. Think of it this way, your car might be able to do 50mph in first gear, but it probably accelerates from 40mph to 50mph faster in second than in first because by the time it’s doing 40mph, it’s already quite a bit past it’s peak power output (unless you have a really peaky engine). Your maximum acceleration at a given mph occurs when you are in the gear where the engine produces the most horsepower at that mph (horsepower is just torque*rpm, so if you’re producing more horsepower at a given mph you’re producing more torque at the tires at that mph, you don’t have to know what the gearing is in the things you’re comparing if you know the horsepower at the mph). The effect is even more pronounced with the electric motor because it produces more power the further it is from the rpm dictated by voltage*kv trying to get to that rpm, and gearing down pushes it further from that rpm. 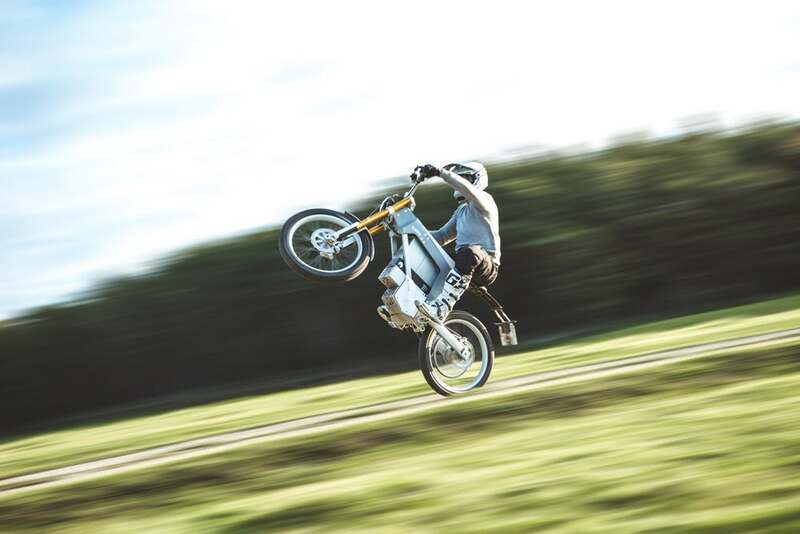 So gearing down might, ever so slightly, increase acceleration from about 0-1mph with the electric motorcycle, but it would reduce acceleration after that. In reality, as long as the motor isn’t so undersized that it overheats and it has a sufficiently powerful battery, an electric vehicle will accelerate faster between any two speeds you care about with taller gearing but will run less efficiently with the taller gearing because it will run hotter (so the exact opposite of what you’re used to with gas engines). I should state that most of this comes from practical experience, I run high performance RC cars that use lithium polymer batteries and brushless motors (similar to most electric vehicles now). I was stunned the first time I geared one way up for a speed run and could suddenly barely control it’s acceleration. I appreciate the effort you have put into your reasoning and response. However, I have empirical evidence of actual electric vehicles with actual multi-ratio transmissions (and more dyno testing) under my belt. Acceleration is purely a function of the thrust put through the tires (minus slip) and the mass of the vehicle. The thrust is created by the torque output of the motor multiplied by the overall gear reduction (ignoring transmission losses). For any given rate of acceleration this is known as “power”. Yes, in theory, you can have torque production fall off so far in a liw gear that the thrust it provides is less than the thrust in a higher gear. I have never seen this in testing. Torque production may drop 10 percent at the top of the range but a typical jump between first and second gear is more like 40 percent or more. You would need to see a drop in torque around 50 percent to see greater acceleration in second gear! Keep your critical thinking cap on, it really stimulates the conversation! I will respectfully disagree, if I may. An internal combustion engine will produce more power if you gear it up. A higher gear requires more throttle for any given speed. Throttle opening is roughly linear with torque output. If you apply full throttle without load, engine revs will climb until the RPM reaches the required power output for the given load. A multi-speed gearbox will indeed increase acceleration of an electric vehicle. Since acceleration is entirely related to power output and not engine torque, providing additional torque at the wheel through a reduced gear ratio at a given speed increases thrust at the wheel (power). I have worked in electric drivetrain development and have easily proven multi-range gear boxes do increase acceleration, pulling capacity, and top speed. Unfortunately, a custom gearbox is much more expensive than a larger motor. With a larger motor (and speed controller), one can increase power enough to provide adequate acceleration and speed without an appreciable increase in motor cost or the added cost and complexity of a gearbox! I wish this bike luck, and as an engineer can even appreciate it’s ugly, form follows function, design, I just don’t expect many folks are waiting for an ultralight, modestly powered, high-end (price wise) bike. An electric Kalk. My girlfriend says she wants one. I’ve loved motorcycles since 2nd grade (a long time), but that thing doesn’t do it for me. The name doesn’t help, either. When my kids were young, we’d trailer 3 bikes and go ride the trails. All 3 bikes, purchased new, cost less than one of these things. I wouldn’t have been willing to dump $40k into the experience. While the range of 50 miles seems low, I don’t recall many days with just the 3 of us that we put more than 50 miles on the bikes playing around in the desert and hills. OTOH, a few of our group rides would have stretched they range pretty tight. With what people spend on bikes, quads, and side-by-sides for a few hours of riding at a time, maybe these things will sell. With the current looks, range, and price, they won’t see any of my money. Looks like electric bikes are here to stay. I like the Haibike mnt bikes I have seen so far, this is more street oriented I suppose. Parts of it look vulnerable. The Sur-Ron Light Bee can do this for $4000 and look better at the same time. Most bicyclist I know are status oriented. If it doesn’t cost (and I complain about the price of motorcycles) over 10k you’re not in the game. Maybe the marketing think tanks are giving out bad advice to manufacturers. The say the buyer demands the latest and most advanced and the buyers as few as they are should get what they want. It could be like it was in 1908 when GM and Standard Oil conspired to squash electric cars in favor of you know what. So what most of the country didn’t have electricity at the time lead acid should have ruled. “They” didn’t want us to have it. But as my lack of faith in electric bicycles ever catching on except for those with low financial intelligence I see electric scooter catching on in Asia and India as long as they keep building coal plants to charge them. Who knows maybe they’ll catch on here if and when quality and range become acceptable here. I suppose I would be faster on bycicle then on this bike. For a few bucks less, you can buy the KTM 690 Adventure shown on this site. Faster, more range, more comfortable and just about better everything else. Does anyone really think it makes sense for us to buy this thing instead af a far superior bike just so we can tell our kids we are saving the environment? How many electric vehicles do you own, Jon? None! and 4 dino guzzlers, cars and bikes included (5 when my 2-smoke gets delivered next month). Not speaking from any pedestal here, and I love my machines. But I’m pretty well convinced we’re destroying the environment, and hoping leccy bikes and cars (and the means to power them) develop quickly enough so they’re just as fun as well as being eco friendly when the time comes to switch. Thanks for the reply. I’m not opposed to electric bikes and doing my bit to preserve the environment, but until range increases and price decreases, they won’t find many buyers. Ultimately the answer to many questions is money. What most people forget to factor is the impact on the environment if these battery augmented vehicles are ever produced in the quantities that would supply mass consumerism. This will poison the planet like never before. The precious elements required to make enough of the light and efficient power packs that everyone expects to have do not exist in enough quantity. We always repeat the same mistakes, thinking that throwing money at something is the solution to a perceived problem that we don’t fully understand. This is over 150 lbs lighter than that KTM, considering how much it costs to shave just a few pounds from a bike, the Cake sounds like a bargain. Yeah, but looking at that thing, would you want to try to land a double on it? It doesn’t cost anything to shave weight by making something weaker or less durable. Not saying that it actually is weaker, but I think I’d put my money on the KTM if you were really going to abuse the thing. There doesn’t seem to be much to that thing. What makes E bikes so expensive? The Battery? Batteries are painfully expensive, but I think the exceptionally low volume probably has more to do with it. between a rock & a hard place isn’t it Jeremy? E-bikes won’t sell because they are too expensive, but they won’t lower the price to an affordable level in order to sell enough of them to bring manufacturing quantities up to distribute cost to the manufacturer. Yep, it’s a tough one. Tesla was in part successful because they gambled on the production they needed to hit a certain price point that they believed was necessary. Then they had to hope they were right. I think the biggest problem though is that, unlike electric cars vs ICE cars, electric motorcycles are not a viable replacements for ICE bikes for a significant number of riders. They’d sell more at lower price points probably as second or third bikes, but I don’t think that would boost numbers sufficiently. Dirt bikes were really close for me. I was strongly considering an Alta. Still might even if I can find someone around that can verify how much range they get in similar conditions to where I ride. Yes, batteries are painfully expensive and they chemically degrade with time regardless of usage. This means that every year their range gets less. How long until the range becomes unacceptable and you have to buy a new painfully expensive battery? Or you try to sell it and find out it is worth very little with a degraded battery. So this is like a Trail90 with longer travel suspension but without the deer carrying capacity or the 200 mile range at around 20 times the cost. Good point! Those 90’s were a lot of fun for the $. Would gladly spend 1/20 the price of this thing for one if I had room for it with the rest of the bike herd. I bought a fairly inexpensive electric bike of considerably lesser spec a while back. I liked the basic idea of starting from a bicycle and adding just as much motorcycle as needed to make a woods bike. The result was a bike that is fun to ride for a while. It is cheap, so the suspension has a lot of stiction, is not sprung or dampened for a guy as famine resistant as I, and it becomes slower to respond if it is flogged too hard for the first 30% or so of the battery. The overall design has the motor mounted a bit low, reducing the ground clearance. But you can say that about just about any little play bike with similar power output. What the bike can do is hang with my buds, provided the trail is suitably technical. The thing handles with pin point accuracy compared to a full on dirt bike. You simply WILL be on the line that you were aiming for. 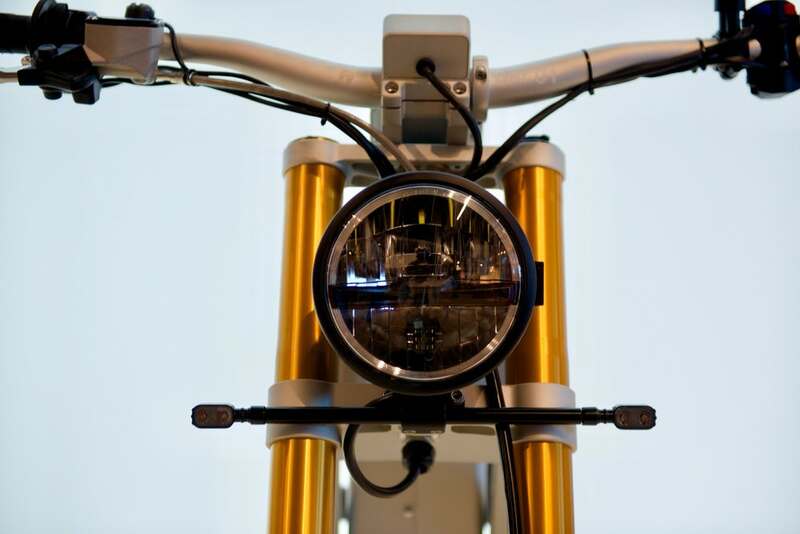 The bike in the article is listed at about 3X power and about 2X battery capacity. Why they are marketing it for the street is odd to me. It would make a really sick stealth DS bike, if you have enough stuff to ride within the range of the battery. Designed by IKEA, hence the name, and the styling. It needs a proper front fender in the worst way. And a chain guard. But I like the idea of this for off-road. Wish I knew how big that battery was. How hard is it to buy 24-inch rubber I wonder? pants leg/shoe ingestion in 3, 2, 1…. No specs on range or swapability of battery packs but the whole “heavier duty than a mountain bike, lighter weight than an ICE dirt bike” concept is fascinating. If this contraption can cover 100 miles or so while being ridden fairly hard they might be on to something. Oh, always have to mention this about EVs – they aren’t zero emissions vehicles, they’re zero emissions at point of use vehicles. Unless you get electricity from a relatively low percentage of zero emissions sources somebody somewhere is dealing with the results of burning hydrocarbon. Until EV’s are of a significant fleet size, the amount of power they consume as it pertains to hydrocarbons burned is lost in the margin of error. A coal fired power plant is more thermally efficient than an ICE and long range ev’s (ex, Chevy Bolt) batteries contain the same amount of energy, fully charged as approximately 2 gallons of gasoline. The battery in this bike would be like a shot glass full.. Seems like it would be easy to get better top speed by just changing that rear sprocket. It might not make enough power for a taller sprocket (and still have reasonable acceleration). Once we find out how many horsies it has we can determine performance. Surely a blast. Ugly as hell but you don’t see it when your on it. That chain and sprocket is going to cause the company, and some riders, a lot of pain and grief. Don’t dump it in a stream or maybe a decent puddle. Don’t let it out of your sight. No tank seam. Well, make that no tank. Sold by IKEA? Maybe throw in some end tables when you purchase it. Where does one put the bread or bagel halves? Finally. Someone found the motorcycle that was supposed to be in the LEGO Movie. Is the name pronounced “cuh-CANNED?” Please work harder to invent more abstract names for the company & (and) the model. I really like the economy of the model including a sign always requiring, and followed by the word (in parenthesis) indicated by the sign. THAT is REALLY cool! Eye (I) could never have thought of that! Moar (more) people need to put the fun back into reading like this! It looks functional, if a little home-built. It also seems like it could look much sharper and more finished with just a little more work. Total price is approximately $13,000. Read anything about how much ride time you get out of that battery? They’re claiming approximately 50 miles for the off road version, which they’ve been promoting non-endemic (wired, the drive, etc.) since last year. There are other, less expensive products like this out there. That’s all you need (or want) on a dirt bike. Now the big question, what does it weigh? > an innovative 150 pound electric dirt bike with 24″ wheels. CAKE has now announced that it will be producing a street legal version called the Kalk&, which will be available in the U.S.
I’d guess not much more… maybe less? I think it’s pretty cool, too. I respectfully suggest reading at the least first line of the body of the text. Okay. But can it wheelie? And where do you put the gas?